I have built a lot of strange airplanes in my time, but this may be one of the stranger and one of the most complex and frustrating. The XSG-1 was one of a trio of prototypes built in the early Thirties to respond to a Navy requirement for a “Scout” to be used for gun spotting from cruisers and battleships. 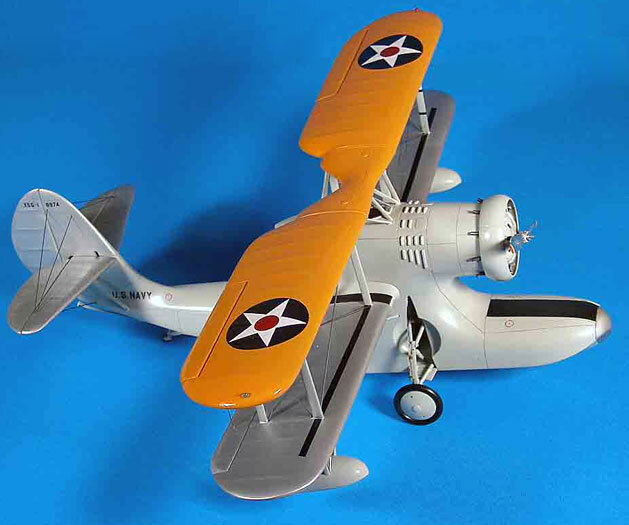 The one-and-only XSG-1 prototype was delivered to the Navy in December, 1932. The Navy test pilots were not thrilled with the XSG-1. 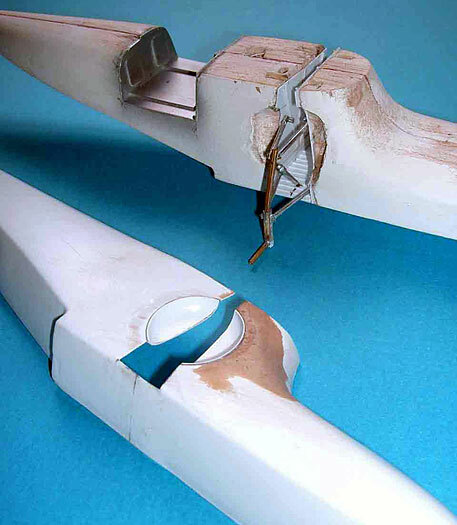 For example, the high cockpit gave good visibility but it was extremely difficult for the pilot to get out of in a hurry, since he was trapped by cabane struts, a headrest, and a high vertical tail. It also had heavy, sluggish controls, and was unstable around all axes. The aircraft was (under)powered by a 413 hp Pratt & Whitney Wasp Jr., and therefore had a top speed of 124 mph. The gunner's position in the awkward rear greenhouse was practically useless with very limited field of fire. Further, communications between the gunner and the pilot was nearly impossible, and the operation of the gunner’s machine gun was awkward and stiff; he actually had to reach outside the airplane (while hoping not to drop it overboard), lift the gun from stowage, and mount it on a track post inside his cockpit. As icing on the cake, water-handling tests were a fiasco; among other problems, the spray blinded the pilot and entered the gunner's compartment, which nearly drowned him. It also had a tendency to kill the engine. It is hardly necessary to add that the XSG-1 was not accepted for production. All-in-all, my kind of airplane. 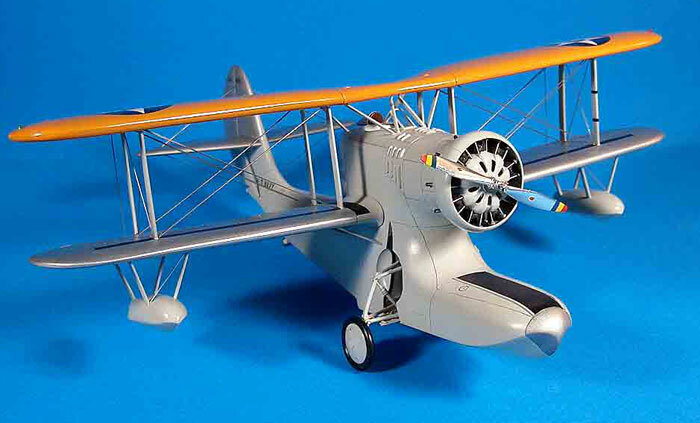 In general, the model was built in pretty much the same way as all my scratchbuilts, but with several specific problems, among them the fact that the landing gear had to be built very early in construction, meaning that the rest of the airplane had to be built around it, and the number and complexity of the struts on this bird; there are 26 of the bloody things (not counting the tail and float rigging). That resulted in very tight quarters around the cockpit. No wonder the pilots didn’t like the thing. Add to all this some goofs on my part, and you will understand why I was glad to get this thing finished. As usual, the pictures tell the story, I will just lead the procession. 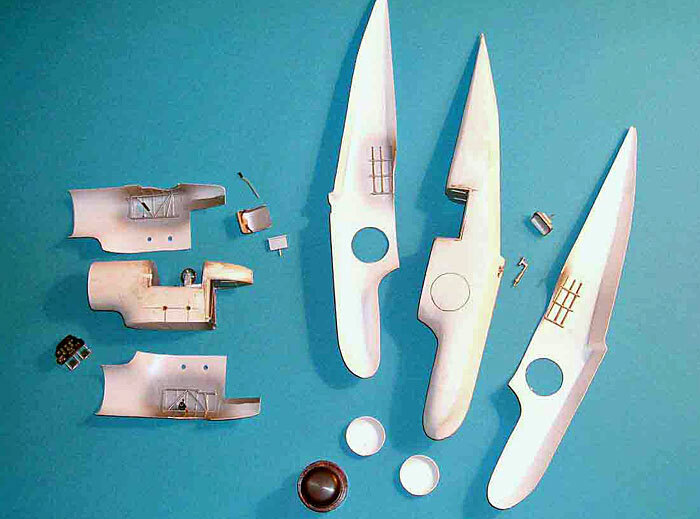 Balsa molds were carved for all the major parts. I chose to make the fuselage (hull?) in two pieces because I was pretty sure that was the only way I could get decent copies of the shapes. So, that meant four parts for the fuselage, plus two for the vertical tail, but it still seemed the best way to go. The molds were vacuum-formed and the pieces were ten cut out and fitted to the wood—a lot of which would remain in the mold. Makes it much easier to attach struts, etc. 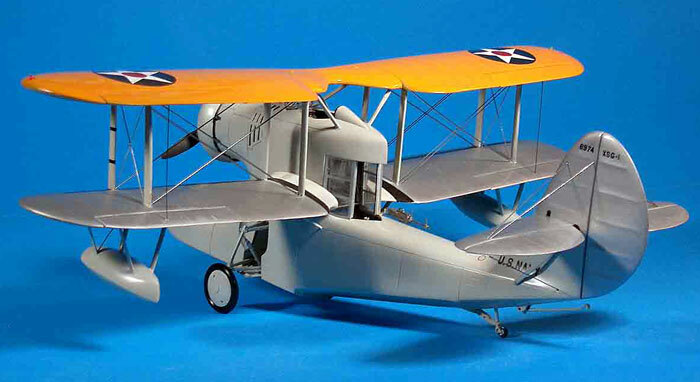 I had assumed (hoped) that I would be able to use some landing gear pieces from either or either the F4F or the Curtiss SB2C kits, but no such luck. Therefore, the gear was built from lots of pieces of brass and aluminum tubing. Assembling it was a bit like three-dimensional chess. 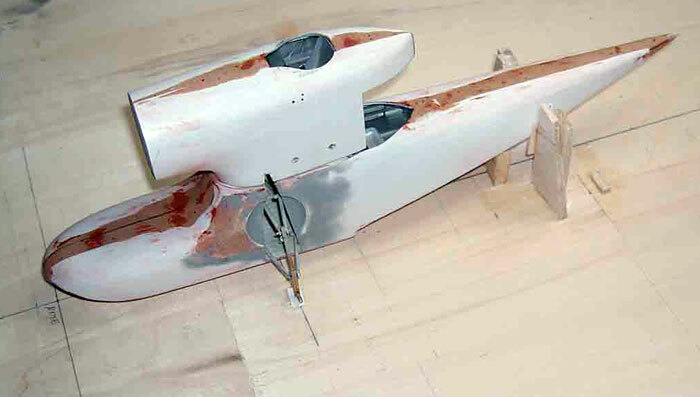 Next, the interiors of both cockpits were built up and glued into the balsa fuselage before the outer vacuum-formed sides were attached. 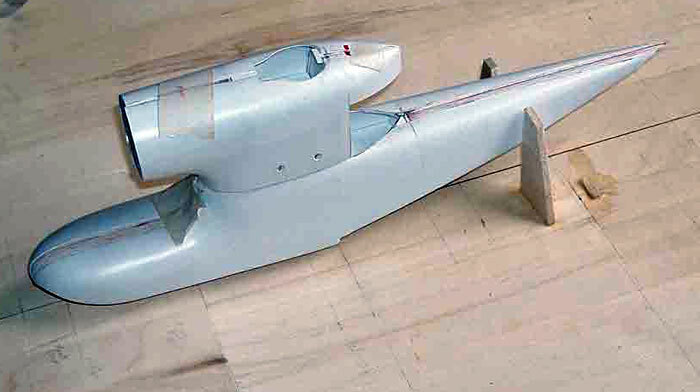 The vertical tail was then added to the fuselage. The louvers in the fuselage were made by using short pieces of small aftermarket quarter-round strips with a little hollowed out on the “down” side. The wings were fairly straightforward. 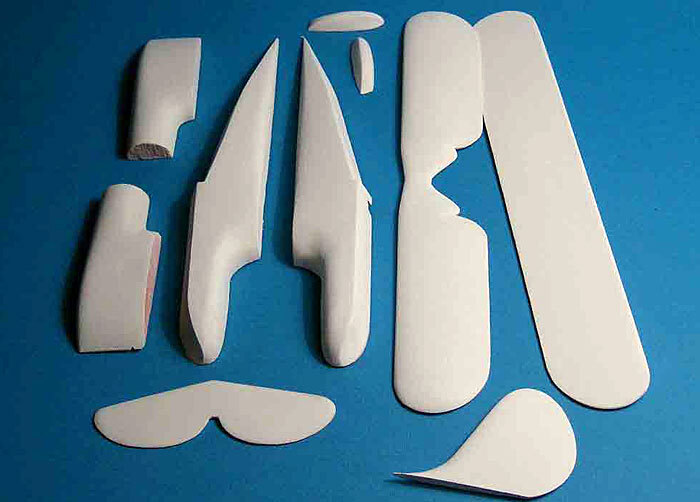 I have tried a number of ways to do fabric-covered wings, but keep coming back to the styrene-strips-heavily-coated-with-auto-primer-and-lots-of-hand-sanding method. Same applies to those on the tail surfaces. 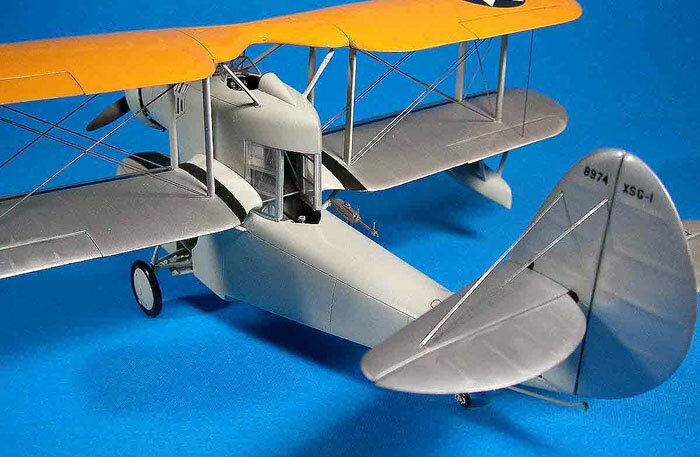 The engine, cowl, prop, tailhook, and parts of the tailwheel were stolen from an F4B-4 kit bought at a flea market for $5. 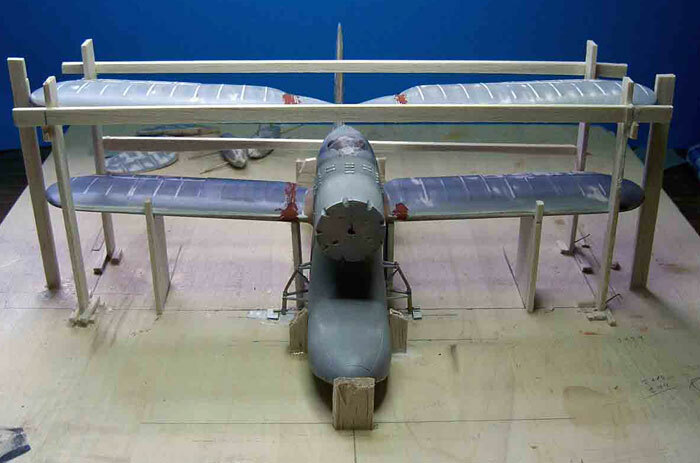 The windscreen was formed over a balsa mold as was the headrest. The wheels were turned from some scrap Corian© and O-rings were used for tires. 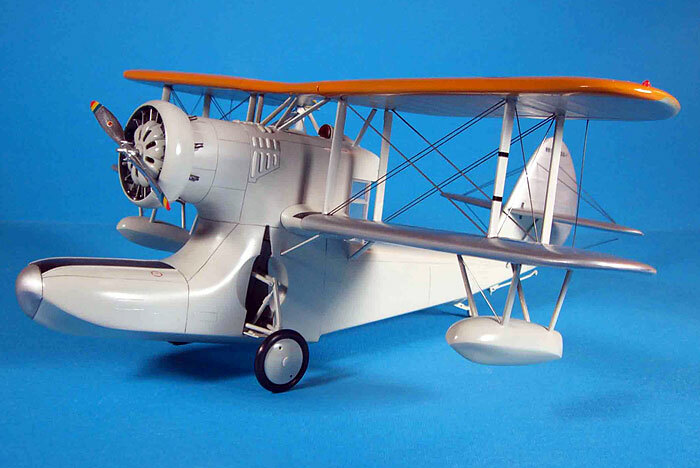 Once all the basic work was done, jigs were made up from scrap balsa and, with the model mounted on the building board, the tedious task of making all those struts began. Just assume that it was highly aggravating and never-ending, and leave it at that. Paint was Gunze, but after the painting and “Futuring” was complete, and some of the decals already in place, the entire surface cracked. Although I had heard about this happening, I had never had it happen to me. I used the same brands as always, waited the same time between coats, and sprayed the same way, but it happened, big time. After the battle with the struts, and now this, it was either bounce the model off the wall or put it away for a while. Using great restraint, I chose the latter. After several weeks, the whole thing was sanded back to the plastic and the entire process was repeated. Except, that is, for the Future part. I was taking no chances this time and used Floquil Flat Finish (thinned) as a top coat. 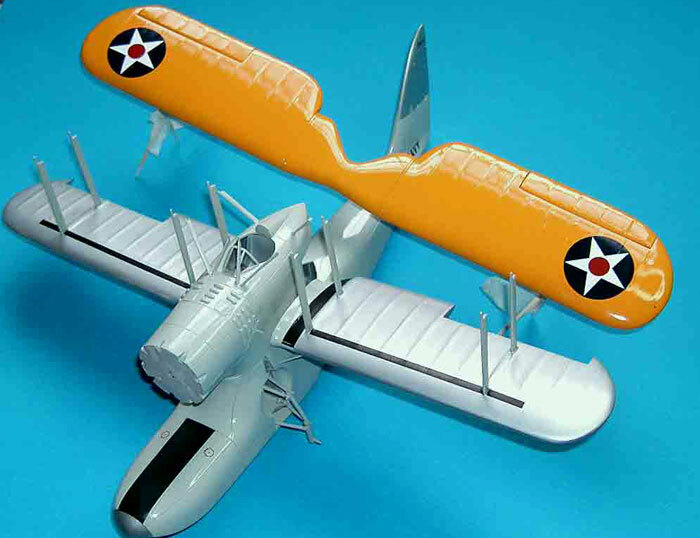 Once that was done, the decals (Yellow Wings stars, computer small lettering) were applied (again), and the rigging glued in place. Bottom line is that this was a trial of a model, to say the least. About all I can say is that it finished, for better or worse.